But I need some help figuring out what type of spread I should add to the wrap next time to give it just a little something extra. -Turkey, cheddar cheese, and lettuce wrap. 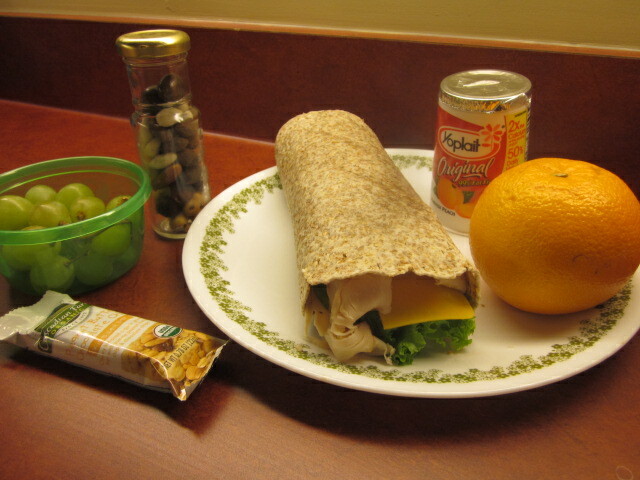 I used an Ezekiel 4:9 wrap which is made from freshly sprouted organically grown grains…and it is flourless! Maybe by seeing some of the ingredients you can figure out the right mixture! I’ve had both the lemon/chipotleaises and lemon is my fave! Hummus is great as a spread. Roasted Red Pepper maybe? Red pepper hummus and bagel chips are one of my favorite lunch sides. I look forward to eating them in my lunch. I believe udandi also uses hummus for some of her wraps. I do like hummus in my wraps, and like Bridgett mentioned roasted red pepper. It is a favorite with turkey. A bit of horseradish. Real horseradish, not sour cream waved in the general direction of horseradish. Or lebneh – yogurt that’s had a bunch of the whey strained out. Easy enough to make at home – just tie up a bunch of yogurt into a cheesecloth and let it drain overnight till its about the consistency of soft cream cheese. (I usually put a couple of layers of paper towel in a colander, set the yogurt in, fold the paper towel over, and put a brick on top. Set the whole thing in a big bowl, and you can save the whey for baking too. I am so glad that you suggested the lebneh…I haven’t ever heard of it before, but how ironic is it that I am planning to make some ketchup following this recipe http://www.progressivepioneer.com/progressive-pioneer/2011/03/real-ketchup.html posted by Progressive Pioneer and it calls for whey that I was going to make by draining some yogurt! How I won’t have to waste the yogurt!! Trader Joe’s has a sweet-hot mustard that would be great on this as well. I do need to make a trip to Trader Joe’s…it is just a haul for me…I do have some Woeber’s mustard that the Lin got me hooked on that might be good to try in the mean time…Mmmm! sort of what trashmaster46 said. i mix herbs/scallions/garlic/whatever is around with a container of greek yogurt. throw it in a colander and put that over a bowl in the fridge overnight. use the remaining yogurt as a spread. delish. I am really going to have to give that a try it sounds wonderful…if only I had made it to the store this weekend and had some turkey!! Next week!